After its introduction in the 1970s, almost every household in American had at least one Crock Pot or electric slow cooker. The appliance is easy to use and easy to clean. The convenience of quick preparation of food cooked in one pot and the promise of a hot meal ready at the end of a long day at work is highly attractive. The use of slow cookers has made a comeback as it is speculated that cooking food slowly at low temperature in a sealed container helps keep moisture and nutrients in your food. Cooking at lower temperatures also prevents cancer-causing compounds such as lipid oxidation products and heterocyclic amines from forming, which are present when meats and fats are cooked at high temperature. Unfortunately, there is a potential danger in cooking with a conventional slow cooker. In 2004, Bill Gebhardt of Salt Lake City’s KUTV investigated the lead content in a number of kitchen tools, including slow cookers. He found that 20 percent of slow cookers were leaching measurable amounts of lead into food. According to the study, when a ceramic vessel is heated to just 80 degrees Fahrenheit, it releases ten times more lead than at room temperature. Slow cookers have the potential to reach more than 250 degrees Fahrenheit. Much of the lead is believed to come from the glaze used in the vessel and they must be in compliance with the FDA guidelines of 1mcg/mL. The organic VitaClay Rice Cooker Chef has a Zisha clay, unglazed earthenware insert which has been independently tested and found to be 99.99 percent lead-free. Simple to use, the VitaClay has a digitized and easy-to-read display, complete with a delayed start option. The appliance is very versatile, accommodating hundreds of slow cooker and rice recipes. Cooking time is also up to four times faster than conventional slow cookers. Its low temperature setting is perfect for making yogurt, as well as germinating rice and seeds for sprouted consumption. 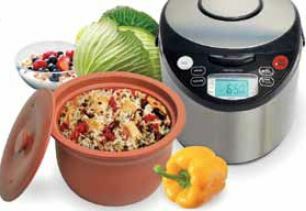 The VitaClay slow cooker and other products can be purchased at VitaClayChef.com or Amazon.com. Audrey Chen is the publisher of Natural Awakenings of Bucks and Montgomery counties. Connect with her at 646-361-7031 or Publisher@NABuxMont.com. November 2014. This entry was posted in DEPARTMENTS, Editorial and tagged audrey chen, november 2014, product spotlight, slow cooker, vitaclay by Healthy Living Bucks and Montgomery Counties. Bookmark the permalink.